Model validation and preparation. 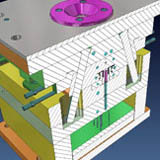 Essential model preparation tools are available to automatically inspect model data for molding feasibility, redundant geometry, sliver faces and geometry inconsistency. The draft analysis provides the ability to quickly interrogate a model using user-defined color draft zones to easily identify undercut and non drafted faces. Duplicate geometry can be highlighted, extracted and automatically isolated into warning layers. Sliver face detection and automatic removal provides the ability to delete potentially problematic faces whilst maintaining solid topology. Finding potential design issues at this early stage will generate huge time savings further along the design process. Automated tool assembly. 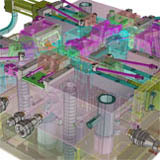 The tool assembly allows the designer to quickly construct a mold base layout and related components. Using a parametric structure based on libraries from leading suppliers including Hasco, DME, DMS, Strack, Meusburger, Cabe, Ceni, Danly, FCL, Futaba, LKM, Pedrotti, Rabourdin, Siam, Sideco, Siderurgica, Siscat, TVMP, UMC, VAP and Victoria, access to the parameters of each individual plate ensures that modification of the tool layout is quick and efficient. 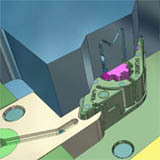 Any change to the plate dimensions will automatically adapt any connecting standard component. Part list information is automatically created and can be exported as an external spreadsheet for downstream processes such as detailing and stock ordering. Undercut release features. Dedicated tools for the creation of undercut release mechanisms such as side actions, lifters and flexible up & away units are all available. The proprietary parametric component library enables the designer to dynamically construct around the molding undercut feature and instantly view the impact on the tool design.